I've been working on eliminating my stash before buying anything new, and today I'm using lots of snippets of some retired BG Wisteria dsp to make the background for this birthday card. I glued all the 1" squares on a scrap of cardstock, then die cut the whole piece with a Top Note die. After it was cut, I ran it through the Big Shot with a CB decorative tiles ef to give it a quilt look. The final touch was to punch some flowers using SU! punches along with some pale plum, and plum pudding cardstock and attach them all with a purple brad. The sentiment is from SU! I'm entering this into the MFP Speedy Fox & Friends challenge #262 - make a background with inchies. I'm also sharing this over at the Snippets Playground #177 - to use snippets. Thanks for stopping by today and I wish you a happy Sunday! Love your choice of embossing...really brings out the patchwork! Great use of snippets and love the colors you selected for this. Those inchies done that way are so pretty. Gorgeous flower too! 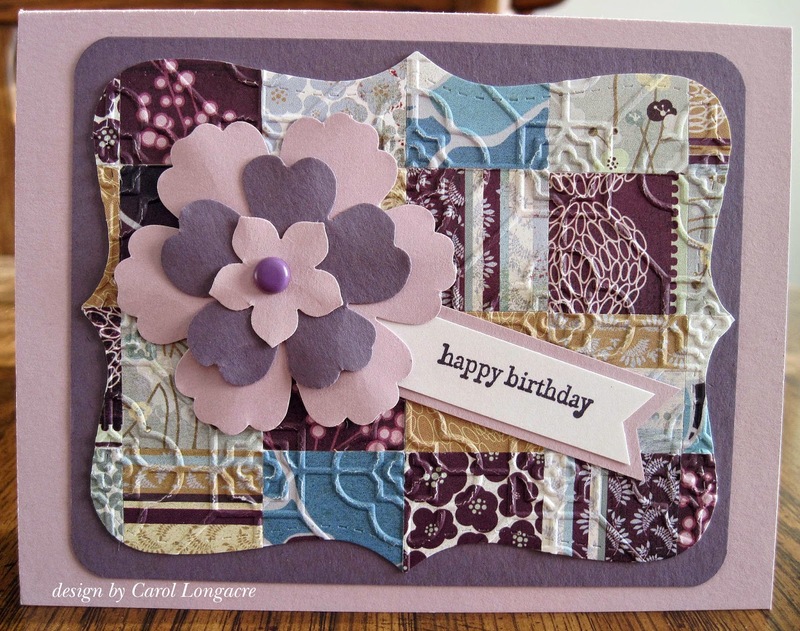 A fabulous card Carol, brilliant patchwork background. I love your patchwork background. It's a great idea to piece the papers together and then emboss it, it looks really good and is a super way of using up some snippets. oh what a fab patchwork creation. beautiful flower, and wonderful embossing. You are doing great with your snippets cards. This one is so pretty! I am currently trying to work through my UFO boxes. have far to many UFO boxes and would like to get it down to just one. Makes it easy to take to the lake as well, since most of the elements are in the card envelopes already! Wow Carol, it's really genial your use of tiled snippets with embossing folders...!!! They look wonderful! As soon as I have my machine again I will try your technique! The flower is so pretty and love top note diecut for the layout frame! Another stunning card by you! Oh what wonderful use of little snippets Carol! I adore the patchwork effect, looks very tactile - and the flower is such a perfect match! Beautiful colors and card. Thank you for sharing with us at MFP Speedy Fox and Friends Challenge. I love how you die cut your inchie background. Excellent! Thanks for joining us at MFP Speedy Fox & Friends challenge! Beautiful card and in my favorite colors. Thank you for joining us at MFP Speedy Fox & Friends Challenge. This is just marvelous! Great colors in your inchies, and so neatly designed, Carol! Pretty quilting. Now I understand your motivation for using us everything. Whatever the motivation, I still applaud you!! I need to figure out small projects I can work on at work during the slow times. The semester ends tomorrow and the slow times are a'coming! Then maybe I'd actually make a thing or two during the week. Such a pretty card! Love your choice of papers. Thanks for joining us this week at MFP/SF&F challenge. Great Patchwork card. I'm still trying to do what you are doing...Still have a long way to go...to use up those images Jim colored for me! The embossing on your patchwork looks so lovely, especially with the flower on top. Thanks for sharing with us on MFP's Speedy Fox and Friends.